Once again, Avdiivka has been cut off electricity for four days; water is supplied according to schedule, heat supply is regular. Two Ukrainian troops died in combat, two were wounded and two more sustained blast injury. Kamianka – Avdiivka – Butovka coalmine remained the epicenter of combat yesterday. “Adversaries concentrated tanks and mortars in the vicinity of Yakovlivka and Spartak and is actively using them. Hostileattacks continue before the dawn, and considerably increase in the afternoon, after 3 p.m.,” informed the spokesman of the Ministry of Defense of Ukraine on ATO related issues Colonel Andriy Lysenko at a press briefing at Ukraine Crisis Media Center. As a result of shooting attacks, Avdiivka has been cut off electricity for four days; water is supplied according to schedule, heat supply is regular. “Militants interfere with repair of infrastructure, namely electric power lines and Donetsk filtering station. Socially important facilities are supplied from generators,” added Col. Lysenko. Moreover, militants violated ceasefire at the Svitlodarsk bulge, south of Horlivka and in the Donetsk airport. Heavy armor was also used there. “In total, 23 hostile attacks took place in the Donetsk sector yesterday, mortars and tanks were used in 12 of them. Over 200 mortar shells and 80 tanks projectiles were launched at our positions, summarized Col. Lysenko. Militants violated the ceasefire in the Mariupol sector 31 times, using heavy armor five times. The situation escalated in Mariinka where militants conducted two mortar attacks in the afternoon and used armor. The largest number of hostile attacks took place in Pavlopil and Vodiane. Russian proxies violated the armistice eight times, using mortars four times. In total, they launched 25 mortar shells at Ukrainian positions. “Main hostilities took place in Popasna district. Militants conducted three mortar attacks between 10 a.m. and 5 p.m., and used light weapons afterwards. Moreover, the adversary violated the ceasefire in Lobacheve and Orikhove. The second attack involved use of mortar launchers,” said Col. Lysenko. 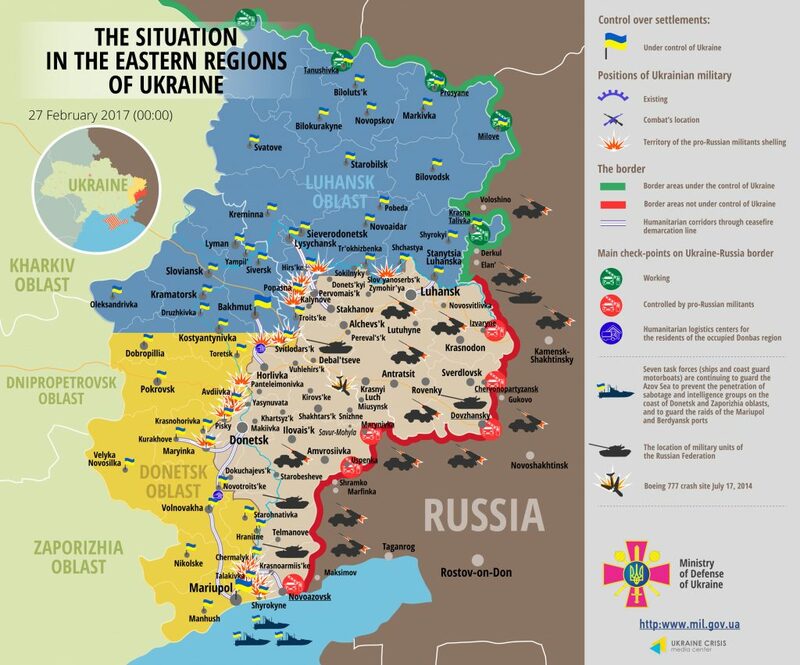 Two Ukrainian troops died in combat, two were wounded and two more sustained blast injury. Report on the military developments as of February 26 is available here. Interactive data on the shelling: chronology shelling chart and the interactive map.